While the rest of the world is still messing around with 4K, Japan is busy formulating plans to introduce 8K satellite broadcasts on a nationwide scale, aiming to have everything in place by 2020. The timetable was recently laid out by Japan’s Ministry of Internal Affairs and Communications, and incorporates the nation’s switch to 4K broadcasts as well. To begin with, Japan is hoping to become the first country in the world to introduce 4K broadcasting nationally, with an ambitious target date of July 2014, just in time for the FIFA World Cup 2014. The plan is for Japan’s CS satellite broadcaster to carry programmes in 4K first, followed by the BS channel and finally, terrestrial TV stations. Following this, Japan’s NHK public broadcasting service aims to carry out its first trials of 8K resolution in 2016, with an eye to having the infrastructure in place to start broadcasting to the entire country in time for the 2020 Olympics. NHK’s targets might seem ambitious, but according to one report from DigiInfo TV, the broadcaster’s preparations are already well under way. Japan’s biggest broadcaster has already begun developing the equipment it needs to enable 8K broadcasts, co-developing a special camera with Astrodesign that incorporates a 33-megapixel image sensor. In addition to this, NHK has also developed the first HEVC real-time codec for 8K video streaming in a collaborative effort with Mitsubishi Electric. HEVC, which was adopted as an international standard earlier this year, boasts four times the compression efficiency of MPEG2. “The video will be encoded at 85Mbps,” said an NHK spokesperson. Data about the direction and speed of moving objects is split across multiple segments, which helps to minimize any loss of image quality where the segments join together. To date, the encoding has only been done at 60Hz, but NHK says that it’ll be able to do the same thing at 120Hz as well. Japan’s Ministry of Internal Affairs and Communications is hoping that nationwide availability of 4K and 8K resolution TV will help to boost consumer demand for the current crop of next-generation televisions that offer four times the resolution of standard HD TVs. 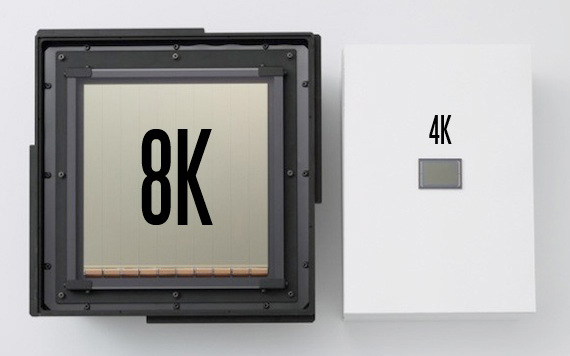 8K televisions, whenever they become available, would offer a fantastic 16 times the resolution of current HD TV.